I hate admitting this, but I'm not much of a brunch person. Like this New York Times article, I am the curmudgeon who stays at home wondering why people would bother waiting in line for two hours just to pay an exorbitant amount for eggs and bacon they could make for themselves at home. "But Michelle!" people will often argue. 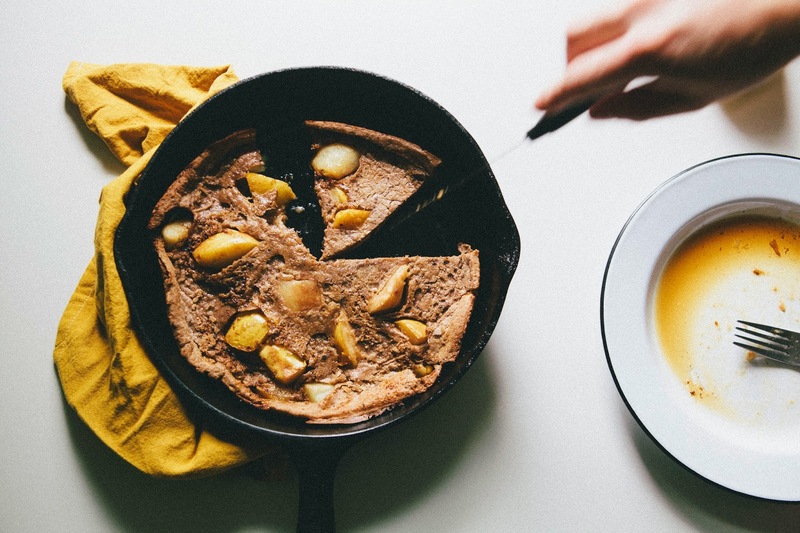 "There are some brunch things that are just too difficult to make at home." To which, I'll often snort: "Like what?" Most responses often relate to eggs Benedict, which I will admit is a bit of a pain to make (because let's be honest here, anybody who says poaching eggs is easy is probably cheating and using one of those weird specialized devices they sell at Sur La Table). But sometimes, people will bring up breakfast sweets like pancakes as part of their defense. A friend who was severely offended by my stance on brunch once argued that it was hard to make pancakes like they did at brunch places. Hers were never as fluffy or well-shaped, and she always made a big mess when she tried to make them at home. Plus, at brunch places, they always had funner toppings and more variety anyway... so why bother at home? 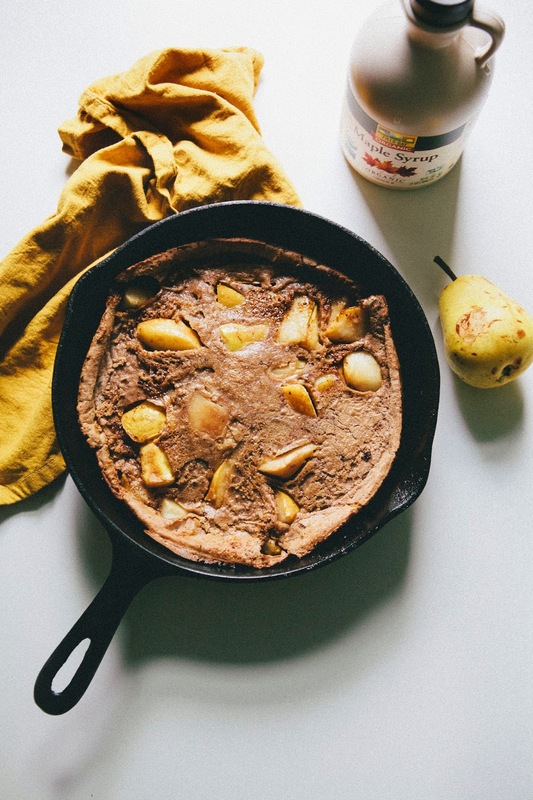 The best part is, with this recipe, you can experiment with different fruits and flavors — swap the pears for apples or bananas, or omit the cocoa powder for a more classic pancake flavor. Experiment with different spices and add ground vanilla bean powder, cardamom and more. Other awesome brunch recipes? The crazy-talented Steph from I Am A Food Blog does a brunch series with posts every Sunday that I love, love, love with recipes like chili and cornbread waffles and eggs and avocado grilled cheeses soldiers. 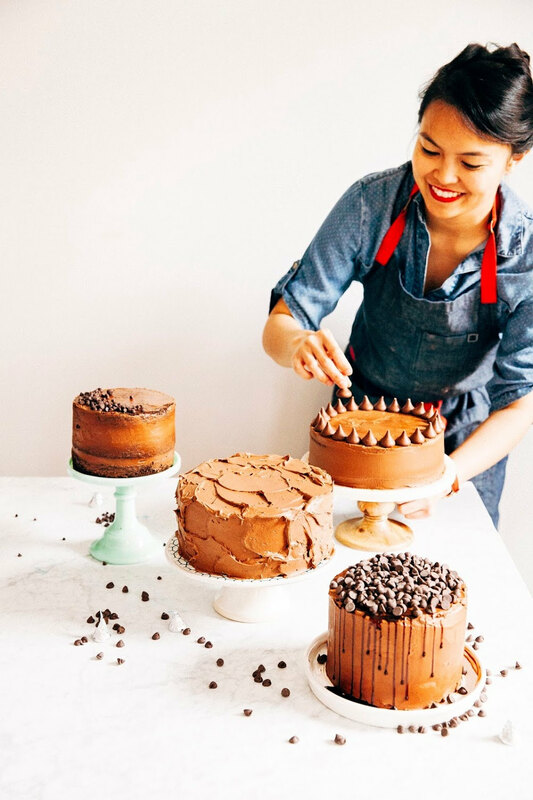 Kathryn, one of my favorite bloggers over at London Bakes, also has some great gems like chocolate and coconut buckwheat waffles and rhubarb and polenta muffins. I've also been dying to make Izy's whole grain double chocolate muffins (seen in Cynthia's beautiful, beautiful post), Molly's eggs Benedict Cumberbatch (ha, geddit, geddit?!) and one of Melissa of The Faux Martha's pretty donut recipes (but especially these baked apple cider donuts). So why bother heading out for brunch? I'll skip the long lines and overpriced any eggs any day. All I need is my cast iron skillet and the internet, and I'm set for life. 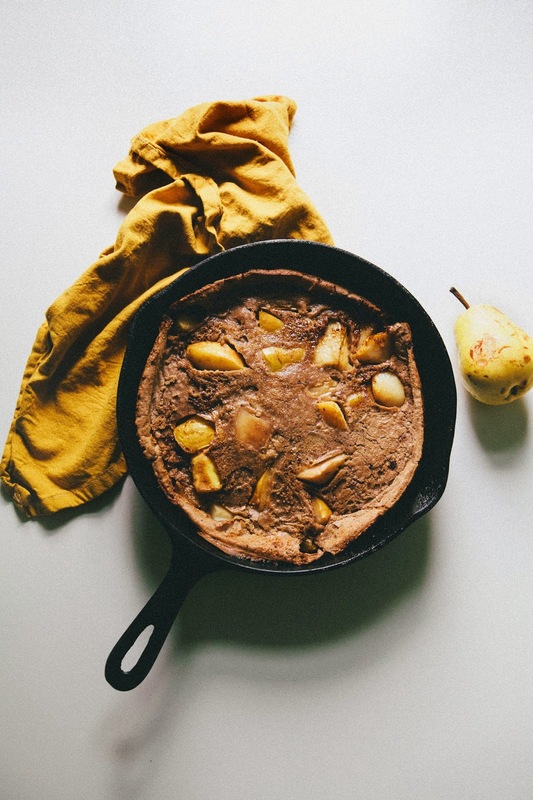 This recipe works best with firm, ripe pears like Bosc pears, which hold their shape when cooked or baked. I also like the contrasting texture that Bosc pears provide. Although they are still delicious, softer pears like Comice or Bartlett pears will get mushy when cooked and will kind of blend into the batter. 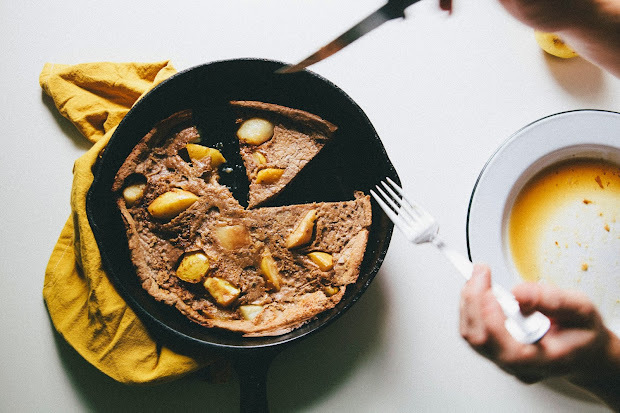 This isn't really a "baker's note", but if you're a visual learner, check out this illustrated version of my Dutch baby pancake recipe. 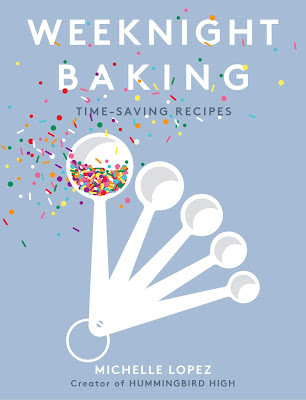 The illustration is by Task and Tool, a startup that helps bloggers illustrate their recipes; check out their site to see their full collection of illustrated recipes. Preheat the oven to 425 (F). Prepare your 2 pears by removing the stems and core, and dividing each pear into quarters. Slice the quarters into halves, and set aside. Melt 2 tablespoons unsalted butter in a 10-inch cast iron skillet over medium heat. Add prepared pears (from the 1st step) and sprinkle 1 tablespoon dark brown sugar and 1/4 teaspoon ground cinnamon. Cook, tossing often, until pears are coated and softened. Transfer to a plate. Allow the skillet to cool slightly and use a damp cloth to wipe out any extra leftover sauce. Once the skillet is clean, transfer to the oven and allow to heat up for 10 minutes, until the skillet is very hot. While the skillet is heating in the oven, make the batter. In a medium bowl, gently whisk together 3 eggs until the eggs are a pale, uniform yellow, before whisking in 3/4 cup milk, 3/4 cup all-purpose flour, 1 tablespoon natural cocoa powder, 1 teaspoon pure vanilla extract, 1/4 teaspoon salt and remaining 1/4 teaspoon ground cinnamon. Continue whisking until the mixture is a uniform pale brown, and set aside. Once the skillet is ready and well heated, carefully add the remaining 2 tablespoons of unsalted butter to the skillet, using the handle to rotate the pan and cover its bottom and sides with melted butter. The butter will bubble and splatter, so be careful! Add sauteed pears to the center of the skillet, and pour the rest of the chocolate batter over the pears. Transfer the skillet to the preheated oven and bake until the pancake is puffed and golden brown around the edges, around 14 to 16 minutes. The center should be set but still custardy. Remove from oven and top with cinnamon; serve immediately, while the pancake is still warm and puffed. My Bloody Marys definitely need work. 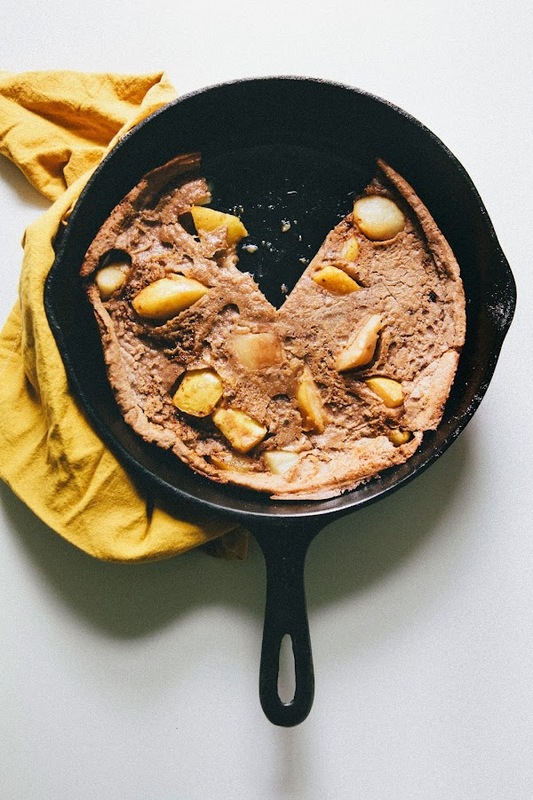 Do you know, I've never had a dutch baby but you're description of them as a giant popover with chocolate has totally sold me. Hurrah for brunch at home! Yummy. Sunday mornings at home are pretty special, I agree. Ahh! I've always wanted to make a dutch baby - they look so magical. Now I want a second breakfast. I'm not a brunch person, either, so I'm glad to know there are others out there! 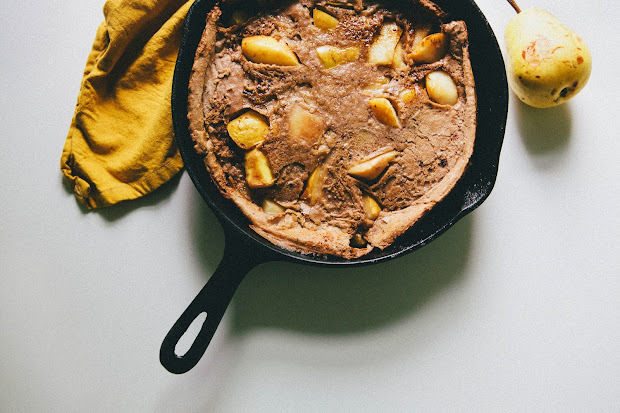 Dutch babies, on the other hand, are totally my thing. Yum, I could eat the whole thing straight out of the skillet! This so gorgeous, Michelle.